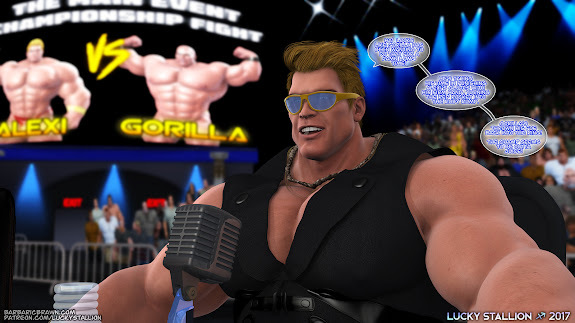 Although this is officially their 23rd battle together in this story's universe, this is Alexi's and Gorilla's second championship match (the first being Rematch: Alexi vs Gorilla). Gorilla, current holder of the Australian and European heavyweight belts, puts his two national titles on the line for another shot at the coveted world heavyweight champion belt. Need to catch up? Check out the first half of the action here! And now for the exciting conclusion of Titans Collide: Alexi vs Gorilla! Although this is officially their 23rd battle together in this story's universe, this is Alexi's and Gorilla's second championship match (the first being Rematch: Alexi vs Gorilla). Gorilla, current holder of the Australian and European heavyweight belts, puts his two national titles on the line for another shot at the coveted World Heavyweight Championship belt. This image set is 77 panels total and will be split into two posts here at Barbaric Brawn. Enjoy, guys!